Sliced bananas and mini tapioca pearls cooked in coconut milk. 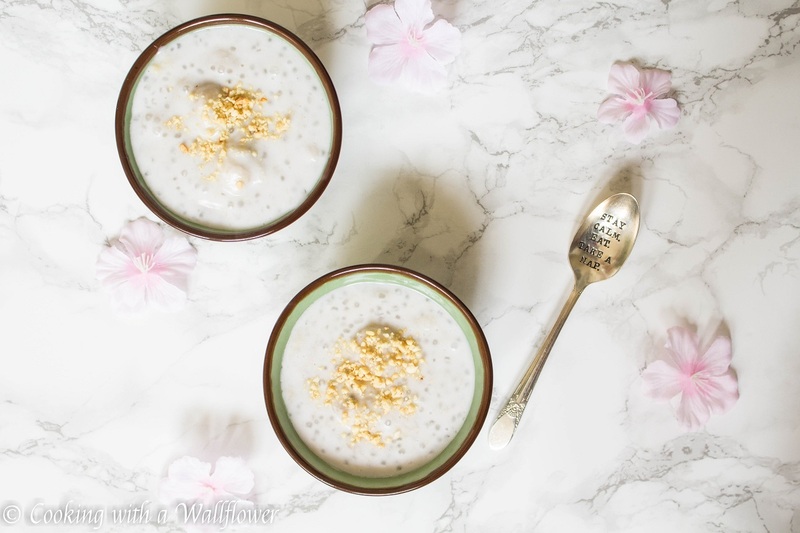 This creamy banana tapioca pudding in coconut milk is a simple yet delicious Vietnamese style dessert. 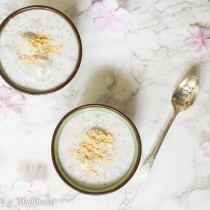 This particular dessert is filled with bananas and mini tapioca pearls in sweetened coconut milk. 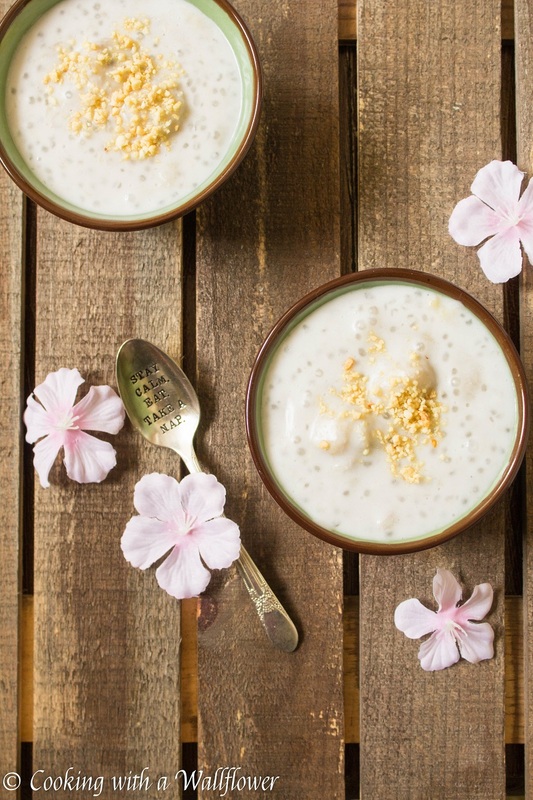 Depending on how much tapioca pearls you add, this pudding can be thicker in consistency or thinner. It’s sweet and deliciously fragrant. What I love about this dessert is that it’s so simple to make. It’s one of those recipes that you can add as much or as little of the ingredients as you want, depending on what you prefer and like. There’s this new app created by Food52 called (Not)Recipe released earlier this week. Have you heard about it yet? The idea behind this app is to show how people cook every day. When you’re cooking, you’re constantly improvising. You’re adding different spices, adjusting the level of salt, tossing in more vegetables, taking out the ingredients you’re allergic to. Things like that. I absolutely love that there’s an app like this, and no, I’m not sponsored to write about it. I just really like the concept, even if the app needs a little more work. My food blog is filled with recipes, but I’ve always wanted my recipes to just be starting points for beginners. Once you know the basics, I feel you can change up the recipe to better suit you because that’s how we should be cooking. We all have different taste buds. So what I like might be different from what you like. Recipes should be there as guidelines, and once you’ve tried it once, you can adjust it to your preference. With the exception of baking. Baking is more of a science so it’s a little bit more difficult to change the ingredients and still yield a similar result. 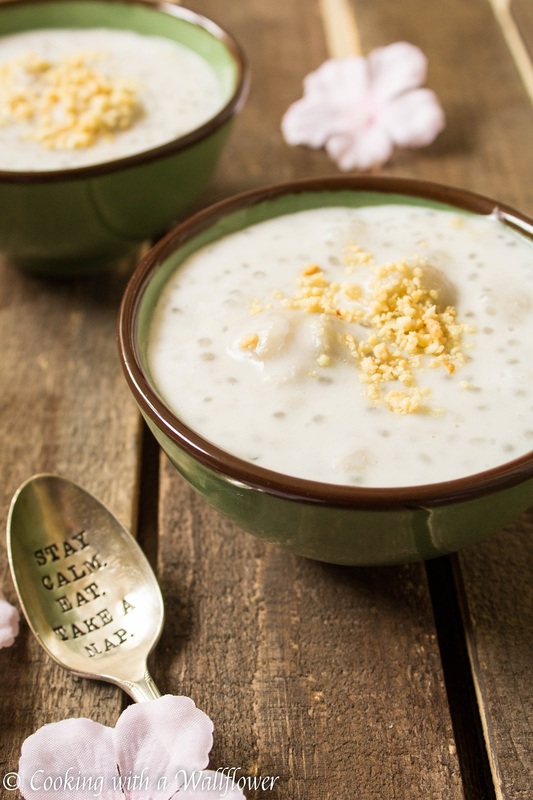 To make this deliciously simple dessert, first soak the mini tapioca pearls in a bowl of water for about 7-8 minutes or so. You want to fill the bowl with water so that the water level is 1/2 inch above the tapioca pearls. This will help the tapioca pearls soften. Drain the tapioca pearls and set them aside for now. In a small pot, heat water over medium heat. 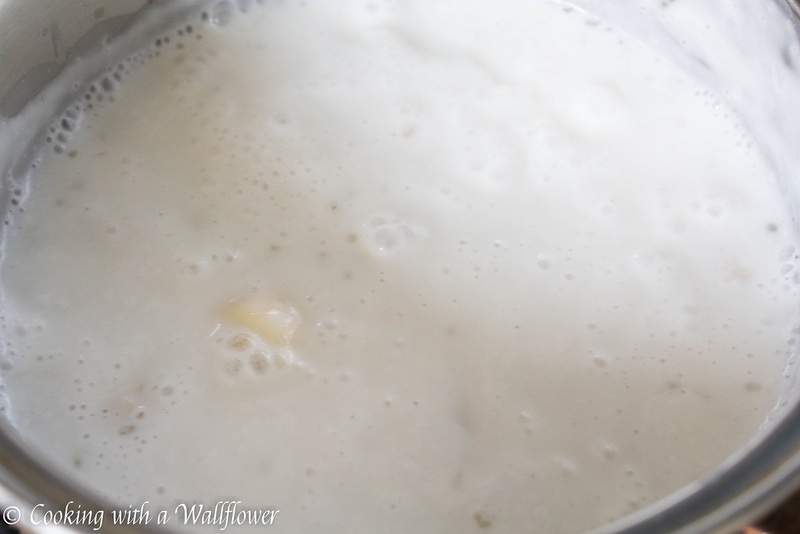 Once the water boils, add the tapioca pearls. Cook the tapioca pearls until they’ve turned from solid white to a transparent see through color. Then add coconut milk, sugar, and sliced bananas. Stir and cook until the bananas have softened. 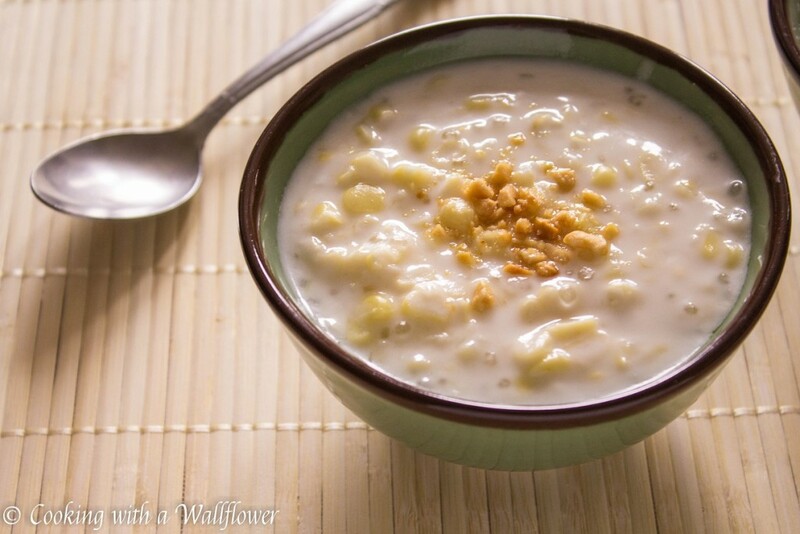 Serve the banana tapioca pudding in coconut milk in bowls topped with crushed peanuts. First soak the mini tapioca pearls in a bowl of water for about 7-8 minutes or so. 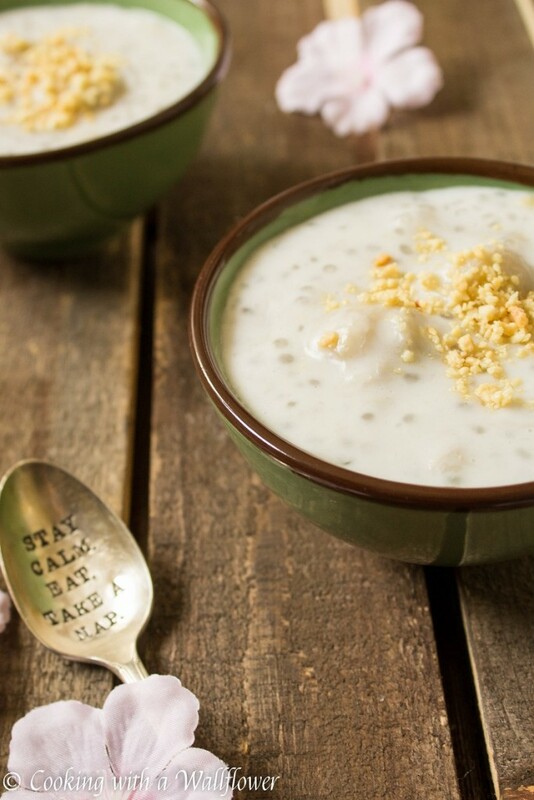 You want to fill the bowl with water so that the water level is ½ inch above the tapioca balls. This will help the tapioca pearls soften. Drain the tapioca pearls and set them aside for now. In a small pot, heat 1 ¾ cup water over medium heat. Once the water boils, add the tapioca pearls. 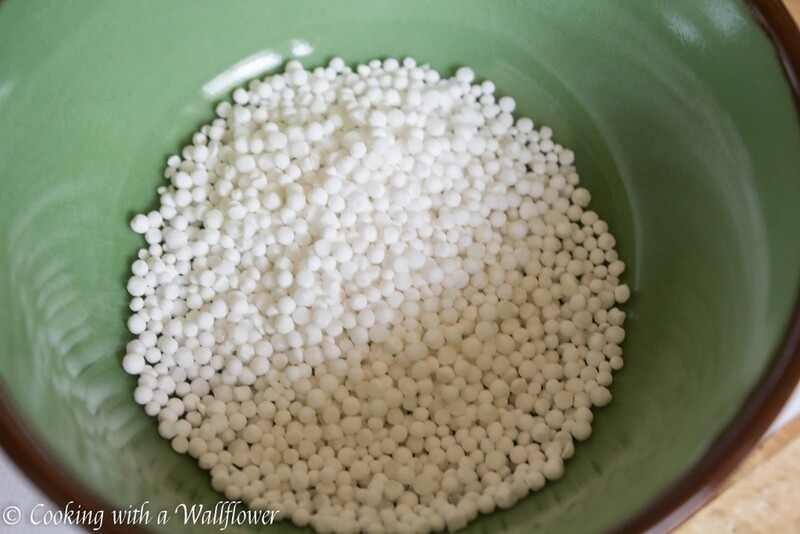 Cook the tapioca pearls until they've turned from solid white to a transparent see through color. Then add coconut milk, granulated sugar, and sliced bananas. Stir and cook until the bananas have softened. You can also try this Vietnamese Corn and Coconut Pudding. This entry was posted in Asian Inspired, Desserts, Gluten Free, Quick and Easy, Vegan, Vegetarian and tagged Asian Inspired, dessert, gluten free, quick and easy, vegan. Love coconut milk! Great dessert. Definitely have to try it, this (and the sweet corn version) sounds really nice – served with a “wise spoon” to boot! Where did you get it from? Don’t know what it is about coconut milk, I crave it lately. Trying not to go overboard with it, wanting to eat it even straight by the spoonful. I’ll have to try your version! This looks delicious! 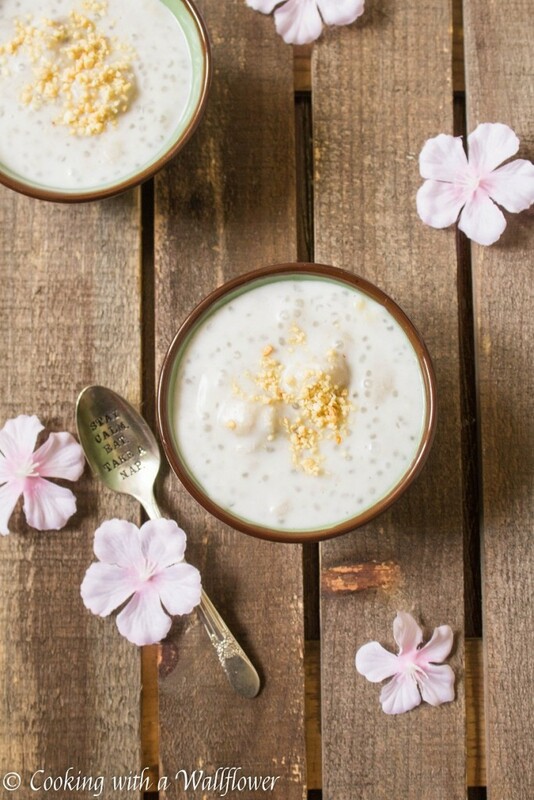 I love tapioca – definitely going to have to try this!